Dominique Morisseau is an actress and playwright. She is receiving steady critical acclaim in her native USA and is about to become better known to a UK audience with her play Sunset Baby. The play recently had its World Premiere at London’s Gate Theatre as part of the Resist Season - a trilogy by new writers exploring political transformations. Ms Morisseauis is a two-time NAACP Image Award winner and Sunset Baby is an ambitious story that is historically sharp and politically astute, with perceptive writing, dramatic dialogue and engrossing performances. The story is straightforward: A long absent father – Kenyatta Shakur - seeks reconciliation with his daughter; he also wants something she has – a dossier of financially and historically valuable correspondence sent to her recently deceased Mother [and his comrade and partner] during his lengthy politically derived incarceration. His arrival sparks conflicting emotions in Nina; a choice between fleecing money from someone who is, in truth, a stranger, or nurturing a relationship with her father. Into the matrix enters the volatile Darren. Dramatically analysing the volatile consequences on two generations coming to emotional terms with the 1960 and 1970’s Black Power Movement, Sunset Baby’s sometimes ugly, jarring contemporary vernacular - with liberal use of the n-word - depicts the difficult options available to these casualties of political and personal tragedy. Pessimistic and despondent - the poisonous effects of the defeat of the Revolution - Darren and Nina see the future only in escape from the hustle and grind; a new city, even a new country. Perplexed by the cutthroat and predatory attitudes of his daughter and her partner, Kenyatta has sacrificed his youth and personal freedom for the grand ambition of a new, progressive society – at the cost of a protracted jail term. 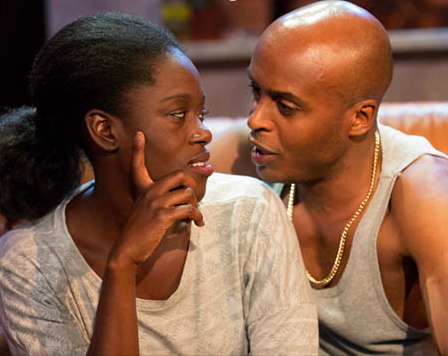 Michelle Asante’s passionate Nina is vulnerable and guarded as she navigates ambivalence about Kenyatta [a distinguished and wise Ben Onukwe] and a love/hate relationship with Darren who, in Chu Omambala’s portrayal, combines both street and book smarts with malice [and a flawed American accent]. As an essay of the divergent attitudes to political and personal issues in two eras the writer asks challenging questions. What exactly is the distinction between the political and the personal? Can there ever be reconciliation between families after separation? Possible answers come from Kenyatta’s video-cammed soliloquies on fatherhood, echoed by Damon’s own parental dramas; and Nina’s weighty emotional baggage unpacks the same dilemma from the view of an abandoned child. There are lighter moments though especially from the Nina Simone soundtrack - as important to the piece as the influence of this performer after whom Kenyatta named his daughter. Designer Francesca Reidy’s economic use of every nook and cranny of The Gate sees the walls of the tight foyer space adorned with background information and vinyl hip hop records and the corridor leading to the intimate auditorium transformed into the garbage strewn stairway of a run-down Estate. In the spartan studio apartment where the action takes place, Director Charlotte Westenra astutely deploys front door, lounge, kitchen and stairs leading off-stage to serve the enthralling drama, and subtle, evocative, wordless scenes harmonise with the accomplished actors, who sustain their level throughout the 100 minute running time. Suspense and tension continue right to the end with only Chu Omambala’s sometimes hesitant acting is the sole misstep amongst these muscular performances. And the convincing script makes just one unnecessary sociological detour into academic theory; and leaves a solitary loose end unresolved. But these are small points: The impressive trios’ well-deserved encore was loud and enthusiastic enough to fill a space larger than this - one of London’s smaller theatre venue. Sunset Baby merits a transfer to a bigger stage and audience. Dominique Morisseau is a big voice for the future. Try and catch this before its run comes to an end.